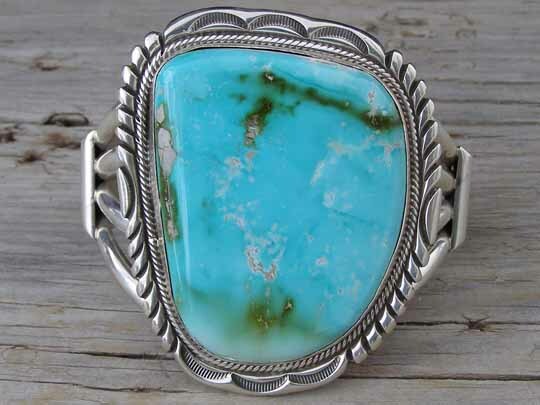 Cecil Atencio Royston Turquoise Bracelet size 7 1/4"
Born in 1956, Navajo silversmith Cecil Atencio has been smithing silver since his early twenties. He was born near Chaco Canyon at Kimbeto, New Mexico, which is little more than a curve in the gravel road situated in a place with blinding dust storms. He currently resides in Tohajiilee, New Mexico with his wife, children and grandchildren. Large natural, untreated stones like this are hard to come by. But rarer still is such a large stone of thick cut and excellent coloration throughout. Cecil has made some beautiful pendants this year with large pieces of Royston turquoise, but this stone is truly rare in its size and superb cut. This is very tight-grained stone polished to glassy smoothness. Cecil's beautiful saw and file work provides decoration to the border of the medallion in which the stone is set. The cuff is formed from four lengths of very heavy gauge low dome Sterling wire which are fused at the terminals. If you've got the size wrist required for this big rock to ride on, forego the inferior stones and offer yourself a gem stone of incomparable quality. Hallmarked C. ATENCIO and stamped STERLING inside the bracelet. Stone: 2 1/8" x 1 11/16"
Terminal to terminal: 5 7/8"
Total inside circumference (including gap): 7 1/4"
THIS ITEM MAY ONLY BE RETURNED FOR CREDIT TO BE USED ON THIS WEBSITE.